Podcasting is on the rise in terms of both popularity and creativity. According to Edison Research, 40 percent of people age 12 or older have listened to at least one podcast, up from 29 percent five years ago. And since Edutopia last reviewed the K–12 podcast landscape, many excellent new podcasts have launched. As the medium continues to evolve, producers are upping their game—making their offerings more enjoyable to listen to with better editing, offering searchable web resources, or using social media to engage with their listeners directly. These are some of the best podcasts we’ve come across in surveying the field. Another great professional-development podcast created by an instructional coach and former teacher. In this weekly series, Angela Watson shares tactical tips, resources, and interviews with experts. Listeners also get a sense of Watson’s coaching chops in monthly coaching call episodes that often include time management and productivity tricks. Be sure to delve into the archives, as a lot of ground is covered in the dozens of episodes: how to respond to rude students, hacking project-based learning, 10 things white teachers should know when talking about race, and more. Vicki Davis is a classroom teacher, author, blogger, Edutopia contributor, and now daily podcast host, and her prodigious contributions to improving education are rivaled only by her passion for her students’ success. Her 10-Minute Teacher Podcast offers a different theme each weekday (Motivational Mondays, EdTech Tool Tuesdays, Wonderful Classroom Wednesdays, Thought Leader Thursdays, and 5-Idea Fridays). The podcast offers a balance of inspiration and practical tips. Davis is faithful to the 10-minute format, so you can take in an episode during a quick errand or workout. Google Certified Trainer Kasey Bell (of the blog Shake Up Learning) and Matt Miller (teacher, blogger, and author of Ditch That Textbook) help you raise your Google for Education game with creative tips for using Google Slides, Hangouts, Chat, Earth, Docs, Forms, Sheets, and more. Episodes of The Google Teacher Tribe Podcast demonstrate creating video projects with Slides, simulating global travel with Google Earth, and getting the most out of Keep. The website has other resources in addition to the podcast. For Talks With Teachers, Edutopia blogger Brian Sztabnik talks with master teachers and asks them about the art and science of their craft to provide “inspiring ideas for English teachers.” You’ll find practical tips, but the real genius here is Sztabnik’s ability to ask great questions. Interviewees include numerous teachers of the year, as well as educators and authors like Rafranz Davis, Scott Barry Kaufman, and the late Grant Wiggins. Recommended for anyone but especially new teachers, who can learn a lot from hearing these educators reflect on their successes and failures. School Psyched Podcast is hosted by three school psychologists, who invite experts to share their insights on a range of topics, including evidence-based social and emotional learning, gifted students, legal considerations, and more controversial issues like racial representation in special education. The episodes are an archive of live video chats hosted on YouTube Live—the video chats will occur on the first and third Sundays of the month starting in September 2017. The hosts take questions and comments via YouTube Live, Facebook, and Twitter (#psychedpodcast). 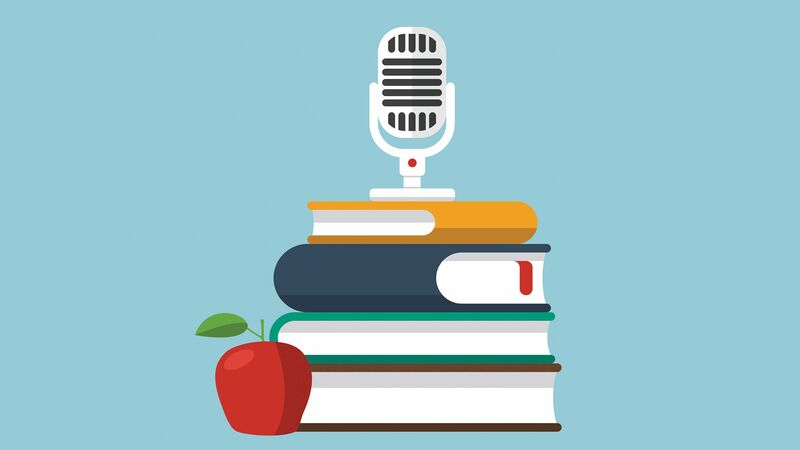 ASCD’s podcast is the ideal solution to the too-many-books-on-the-nightstand problem. It features short interviews with ASCD authors discussing their work—it’s a sampler plate, allowing you to check out an author, hear their ideas, and then decide whether to read the whole book. Recent topics: differentiating academically diverse classrooms, with Carol Ann Tomlinson, and student ownership and choice around homework, with Mark Anderson. Produced in partnership between American Public Media and the Hechinger Report, Educate is a professionally produced journalistic look at issues in education. Many stories feature schools and communities grappling with challenges around equity and inclusion. Topics include food insecurity, why competency-based learning works for underrepresented kids, and how some schools are finding alternatives to suspension.